Posted on Mon, Mar 5, 2012 : 5:54 a.m.
Aral Gribble and Drew Parker in "Dead Man's Shoes." 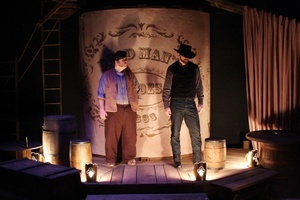 After spending Saturday mornings watching cartoons, playwright Joe Zettelmaier—author of “Dead Man’s Shoes,” now being staged by Performance Network—would, as a child, watch movies set in the Old West. Clint Eastwood flicks appealed to him more than John Wayne’s oeuvre did; and when Zettelmaier decided to try his hand at writing a play in the same genre, he did some research, and the second or third item he found online was a story of a former Wyoming governor who’d owned a pair of shoes made from the remains of a lynched outlaw cattle rustler. Rather than tell the governor’s story, though, “Dead” spins a fictional tale inspired by this historical tidbit. Focusing on Injun Bill Picote (played by Drew Parker), who’s just escaped prison with a drunk camp cook and Army deserter named Froggy (Aral Gribble), the darkly comic play follows Picote’s journey to avenge his friend. But on the way, Picote confronts something long forgotten: his conscience. And as with most contemporary takes on the Western, “Dead” doesn’t sugarcoat or nostalgically glamorize its historical context. What: Joseph Zettelmaier’s new dark comedy, set in the Wild West of 1883, tells the story of an outlaw who escapes prison (with the help of a hard-luck drunk named Froggy) to avenge a friend, only to confront something long-ignored: his conscience. Where: 120 E. Huron St.
How much: $27-$41. The Thursday, March 8 preview performance at 7:30 p.m. is pay-what-you-can, with a suggested donation of $15 (reserve tickets for this show in advance, as it sells out quickly). Other preview performance tickets cost $22-$32. 734-663-0681 or www.performancenetwork.org. “Dead” is a co-production of Performance Network and Williamston Theatre, which recently hosted the world premiere; and while in development, the script won a grant in the form of an Edgerton Award. But the song came after the script; and if you’re imagining the playwright performing terse, Eastwood-esque showdowns in the privacy of his own home during the writing process, you wouldn’t be far off. We saw &quot;Dead Man's Shoes&quot; up at the Williamston Theater, and it was absolutely fantastic. Can't wait to see it again in Ann Arbor!